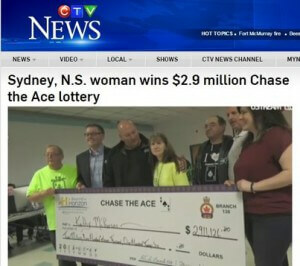 A woman from Sydney, NS has won the first ever jackpot in the Chase the Ace lottery. Kathy McPherson finally won the $2.9 million jackpot which had accumulated in the twelve months since the game was first played. The happy winner says all she had ever won before this was a couple of dollars playing 6/49. Now she says she is seriously considering retiring from her job. She also has plans to give something to help the Fort McMurray wildfire relief efforts.